For the song by Capital Cities, see Kangaroo Court (song). For the EP by Ritual, see Kangaroo Court (EP). 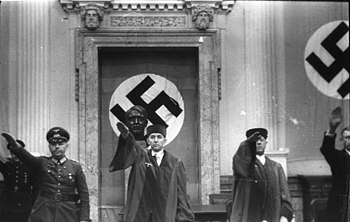 A session of the People's Court in Nazi Germany, widely described as a kangaroo court. A kangaroo court is a court that ignores recognized standards of law or justice, and often carries little or no official standing in the territory within which it resides. The term may also apply to a court held by a legitimate judicial authority who intentionally disregards the court's legal or ethical obligations. The defendants in such courts are often denied access to legal representation and in some cases, proper defence. Prejudicial bias of the decision-maker or from political decree are among the most publicized causes of kangaroo courts. Such proceedings are often held to give the appearance of a fair and just trial, even though the verdict was already decided before the trial actually began. A kangaroo court could also develop when the structure and operation of the forum result in an inferior brand of adjudication. A common example of this is when institutional disputants ("repeat players") have excessive and unfair structural advantages over individual disputants ("one-shot players"). The term kangaroo court is often erroneously believed to have its origin from the courts of Australia's penal colonies. However, the first published instance of the term is from an American source in the year 1853. Some sources suggest that it may have been popularized during the California Gold Rush of 1849 to which many thousands of Australians flocked. In consequence of the Australian diggers' presence, it may have come about as a description of the hastily carried-out proceedings used to deal with the issue of claim jumping miners. Ostensibly, the term comes from the notion of justice proceeding "by leaps", like a kangaroo – in other words, "jumping over" (intentionally ignoring) evidence that would be in favour of the defendant. An alternative theory is that as these courts are often convened quickly to deal with an immediate issue, they are called kangaroo courts as they have "jumped up" out of nowhere like a kangaroo. Another possibility is that the phrase could refer to the pouch of a kangaroo, meaning the court is in someone's pocket. The phrase is popular in the UK, US, Australia and New Zealand and is still in common use. It is also possible that the Australian miners used it to describe the actions of local American vigilantes who, because of claims of lawlessness amongst the Australians, took matters into their own hands to the point of hanging several without trial. The term is sometimes used without any negative connotation. For example, many Major League Baseball and Minor League Baseball teams have a kangaroo court to punish players for errors and other mistakes on the field, as well as for being late for a game or practice, not wearing proper attire to road games, or having a messy locker in the clubhouse. Fines are allotted, and at the end of the year, the money collected is given to charity. The organization may also use the money for a team party at the end of the season. Some examples of adjudication venues described as kangaroo courts are the People's Court (Volksgerichtshof) of Nazi Germany that convicted people who were suspected of being involved with the failed plot to assassinate Hitler on July 20, 1944. Another example is the trial of Pol Pot and his brother Ieng San by the People's Revolutionary Tribunal in Cambodia in August 1979. After a lengthy trial with a duration of five days, both were sentenced to death in absentia on August 19, 1979. Conclusive evidence showed that the verdicts and the sentencing papers had been prepared in advance of the trial. Relying on this evidence the United Nations proceeded to delegitimize the tribunal stating that it did not comply with standards of international law. During the Romanian Revolution in 1989, President and Communist Party General Secretary Nicolae Ceausescu and his wife Elena were sentenced to death by a kangaroo court of soldiers from the Romanian People's Army, which recently switched to the side of the revolutionaries. ^ "kangaroo court". Merriam-Webster Dictionary. Retrieved 2011-11-11. ^ a b Adams, Cecil. "What's the origin of "kangaroo court"? Is "kangaroo" aborigine for "I don't know"?". The Straight Dope. Retrieved 1 October 2012. ^ "Minor League Baseball In this court most anything goes". The Bulletin. Archived from the original on April 11, 2013. ^ "Kangaroo Court". Legal Dictionary. ^ Bouton, Jim (1990). Ball Four (2nd ed.). Wiley. ISBN 0-02-030665-2. ^ Chandler, David (2008). "Cambodia Deals with its Past: Collective Memory, Demonisation and Induced Amnesia". Totalitarian Movements and Political Religions. 9 (2–3): 355–369. doi:10.1080/14690760802094933. Retrieved 2018-06-12. Look up kangaroo court in Wiktionary, the free dictionary. The Straight Dope: What's the origin of "kangaroo court"?